Human water regulation, groundwater lateral flow and the movement of soil frost and thaw fronts affect water and thermal processes, as well as energy and water exchanges between the land surface and atmosphere. Reasonable representation of these processes in land surface models is very important to improving the understanding of terrestrial eco-hydrological processes and land-atmosphere interactions. Recently, scientists from CAS institute, XIE Zhenghui, ZENG Yujin, Liu Shuang and their co-authors in LASG/Institute of Atmospheric Physics synchronously incorporated the schemes of anthropogenic water regulation, groundwater lateral flow and the movement of soil frost and thaw fronts into a land surface model, which is then named the Land Surface Model for Chinese Academy of Sciences (CAS-LSM). Meanwhile, they devised and implemented the schemes describing model resolution conversion between groundwater flow module and the land surface model to parallelly simulate the large-scale and high-resolution groundwater flow and its impacts. 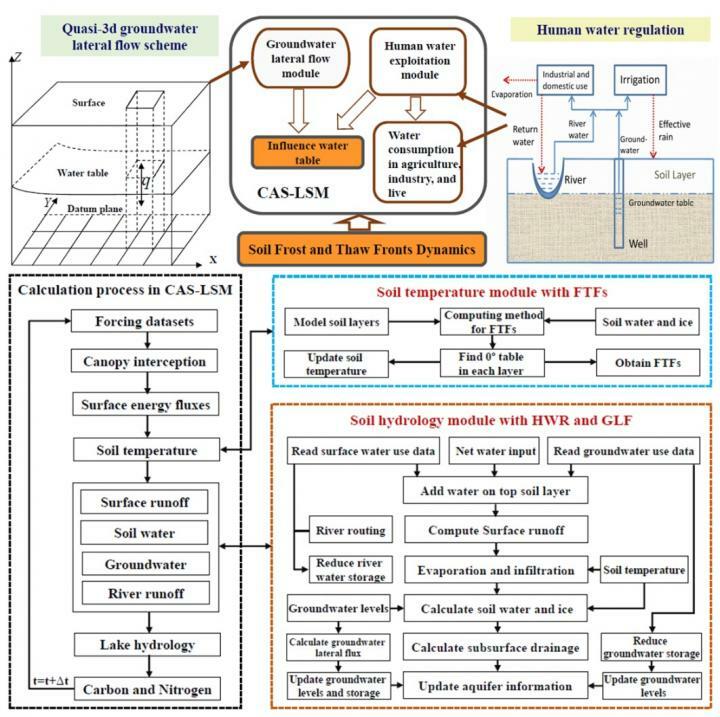 Simulations using CAS-LSM were conducted for both Heihe River Basin in China and the globe, respectively, to investigate the impacts of anthropogenic water regulation and groundwater lateral flow on land processes and the response of frozen soil to climate change. Compared with observations, CAS-LSM reproduced the distributions of groundwater, evapotranspiration and permafrost reasonably, and well matched the temporal changes in ground temperature, heat fluxes and soil frost and thaw fronts. The results show that water use raised the latent heat flux and reduced the sensible heat flux, net ecosystem exchange and streamflow recharging to an eco-fragile region, and the active layer thickness increased 8.63 mm/year for permafrost in Heihe River Basin. Global groundwater lateral flow significantly modified the equilibrium water table patterns in North Africa, the Arabian Peninsula, central Asia and southern Australia, deepening the water tables by more than 6 m. Results suggested that CAS-LSM is a potential tool for studying land surface processes. This research finding has been published in Journal of Advances in Modeling Earth Systems and Journal of Geophysical Research – Atmospheres.